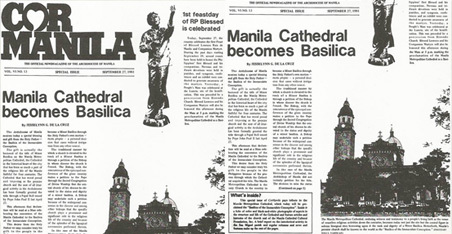 As an enduring witness to the faith of millions of Filipinos and as the venue of many important religious activities participated in by two Popes, the Manila Cathedral earned the title of Basilica of the Immaculate Conception by virtue of a Papal bull (decree) issued by Pope John Paul II on April 27, 1981. This was a special gift from the Holy Father to the Filipino people because it happened through his direct intercession. The Manila Cathedral is the only church in the country to become a minor basilica through the Holy Father’s own motion – motu propio – a personal decision that came without any prompting from any other source. Sacred Congregation of Divine Worship that the central church of his diocese be elevated to the status and dignity of a minor basilica. A bishop may undertake such a petition through a widespread consensus in the diocese and among other bishops that the specific church plays a prominent and significant role in the religious life of the country and that the splendor of the liturgical ceremonies performed therein is extraordinary. Pope John Paul II first expressed his wish for the Manila Cathedral to become a basilica to Jaime L. Cardinal Sin, Archbishop of Manila, during the Pontiff’s visit to the Philippines in February 1981, right after he celebrated Mass on the first day. In April of the same year, the Manila Metropolitan Cathedral was declared a Minor Basilica. As a Basilica, Manila’s premier church acquired international or superlocal character. It was granted the right to bear the Coat of Arms of the Vatican City on its façade and the crossed keys of St. Peter on all its furniture, liturgical vestments and linen, and to adopt its own logo or seal. The rector of the Basilica was also to wear the particular vestments for his new position for special liturgical and official occasions. The vestments consist of a black silk mossetta with red linings, buttonholes and buttons worn over the surplice. Churches elevated to the rank of Minor Basilica are, in many instances, outstanding for their architectural and artistic preeminence. In other cases, they are closely linked to major religious movements that form the Christian moral conscience of the country’s history. In some cases, a Church is declared a basilica because of its relation to an outstanding saint.